Communication Systems are built on Embedded Systems. In every niche of electronics, Microcontrollers, SoC and DSPs have become indispensable. In 2015 i have even begun to see Touch Screen based Test Instruments. Virtual Instruments in Small Devices like Tablet Computers are a Reality today. Industrial Process Monitoring has become easy using Tablets, thanks to the Web you can watch the Production and Process Lines from Home. Projects of Ronald - Simple Oscilloscope, Nixie Tube Projects, Many Types of Clocks, Valve Tube circuit Ideas. Electronics Club - Construction of Projects, Soldering Guide, 555 Timer, Circuit Symbols. by John Hewes. Electronics Concepts at HyperPhysics – Excellent reference for students learning Electronics. Play-Hookey - Online Classroom - Interactive Resource, Electronics Edutainment. These tools are used for electrical circuit design, schematic capture, simulation, prototyping, and production. 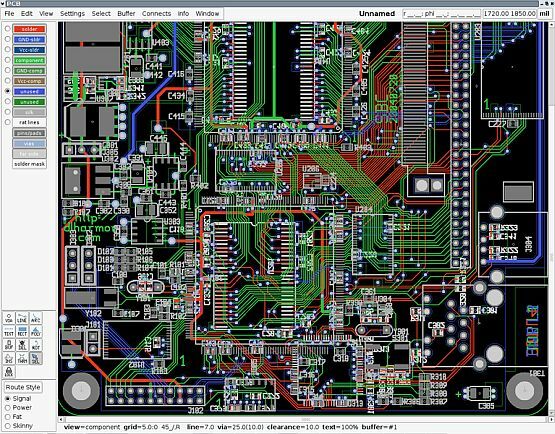 gEDA full GPL'd suite of Electronic Design Automation tools. Airborn - AirBorn Electronics provides custom designed electronic circuitry. Power Supply Guide - SMPS, Switching Power Supply, Magnetics, Power Inverters. Hardware Book - Connector details, cables, adapters, Tables, filters. Rick's eCircuit Center - Design, test circuits using the SPICE simulator: Op amps, filters. TechLib.com - A technical library for the hobbyist and electronics experimenter. ELM by Chan - Circuit testers, Oscilloscopes, Signal generators, Sensor circuits. Motor Control. Qucs - Quite Universal Circuit Simulator - Integrated circuit simulator; large-signal, small-signal, noise in circuit. Kainka Mikrocontroller - Circuits, software, ideas, projects, information, microprocessor, SBC. Reads51 - Reads51 is an integrated applications software development system. interfacebus.com – Leroy Davis, Engineering Index, Connectors, Interface Buses, Standards, Hardware Manufacturers. PJRC: Electronic Projects - Paul and Robin, Teensy USB Board, 8051 Tools, Design data and on-line shop. FPGAs are fun! – FPGAs FPGA, Logic and CPLD tutorials, projects and boards. Ttuxgraphics.org - DIY projects: AVR microcontroller electronics and Fun with Science.